Meet our Young Science Ambassadors! 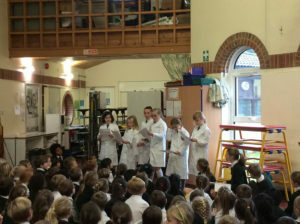 We are very proud to introduce our Young Science Ambassadors! 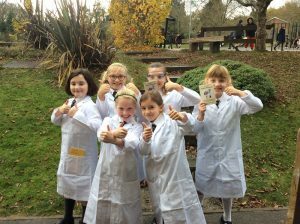 Saskia, Charlotte, Freya, Leah, Megan and Helena are on a mission to encourage the rest of the school to love Science as much as they do. 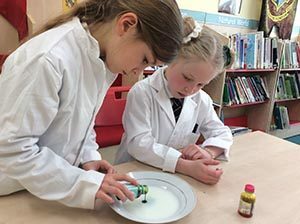 Every Monday lunchtime they are going to be taking part in Science Club with Mrs Matthews where they will be increasing their scientific knowledge through experiments, exploration and hands-on fun! Place m and m’s of different colours in glass bowls making sure that the ‘m’ is facing up. Pour room temperature water into the bowls so that the chocolates are completely covered. The colour begins to dissolve and sinks to the bottom. The ‘m’ floats to the surface of the water. The ‘m’ doesn’t dissolve in water and is attached to the chocolate with an edible glue that dissolves in warm water. Since the letter is less dense than water, the letter peels off and floats as the rest of the chocolate shell dissolves. You could use hot/cold water instead of room temperature water. You could try other liquids such as vinegar or vegetable oil. Today we investigated the effect of water on wood after discussing how annoying it is when front doors become difficult to open and close after it has been raining heavily! 1. Collect 5 toothpicks and bend in the middle, but do not break them completely. 2. Place them in a circle with the broken points touching one another. 3. Carefully put a few drops of water in the middle. 4. Wait and watch as they glide into place to form a star like synchronised swimmers! The water makes the wood expand, the broken ends press against each other and the toothpicks open out. The same thing happens to doors when it’s humid- they swell up and get jammed. Today’s session involved investigating liquids and how they react with each other. Pour milk onto a plate making sure that it completely covers the bottom. Allow the milk to settle. Add one drop of each of four colours of food colouring — red, yellow, blue, and green to the milk. Keep the drops close together in the centre of the plate of milk. Find a clean cotton bud for the next part of the experiment. Predict what will happen when you touch the tip of the cotton bud to the centre of the milk. It’s important not to stir the mix. Just touch it with the tip. Now place a drop of liquid soap on the other end of the cotton bud. Place the soapy end of the cotton bud back in the middle of the milk and hold it there for 10 to 15 seconds. Look at that burst of colour! Add another drop of soap to the tip of the cotton bud and try it again. Experiment with placing the cotton bud at different places in the milk. Notice that the colours in the milk continue to move even when the cotton bud is removed. 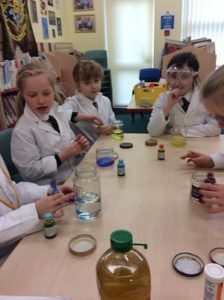 Today we were very excited as we helped out in the Year 2 classes during their Science lessons. Both classes were carrying out a practical lesson which was similar to the one that we carried out in Science Club yesterday so we were able to share our Scientific knowledge with them. 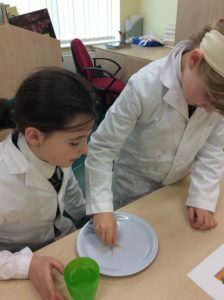 They were investigating yeast in preparation for their ‘Pudding Lane Day’ next week where will be baking their own bread. We are hoping that we get a taste of a freshly baked bread roll in return! Blowing Up A Balloon With Yeast! To activate the yeast we needed to warm it up so we filled the bottle up with 3cm of warm water. We then added a teaspoon of yeast and gently swirled the bottle for a few seconds. Next we then needed to give it energy by feeding it so we added a teaspoon of sugar and swirled the bottle again. Finally we placed the neck of the balloon over the neck of the bottle and left it in the sunshine for about 20 minutes. To our excitement our balloons then started to inflate! As the yeast eats the sugar it releases a gas called carbon dioxide. The gas fills the bottle and then fills the balloon as more gas is created. We thought about what we could change if we were to do this again. 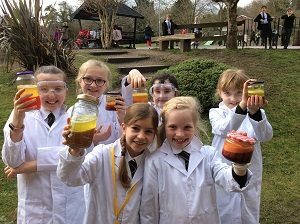 Ideas included changing the size of the water bottle; changing the ‘food’ that we give the yeast eg honey or syrup and using more/less water. 1. Pour the water into the jam jar/bottle until it is approximately one third full. 2. Add the oil. You may have to wait a few minutes for the oil and water to separate. 3. Add a few drops of food colouring. The drops will pass through the oil and then mix with the water below. 4. Drop the tablet into the bottle. Watch it sink to the bottom and the lava lamp begin to work! Does the size of the jar/bottle affect how many blobs are made? Today we were interested in finding the answer to the question: Will lemons always float in water? First, we put whole lemons in water and could see that they floated. 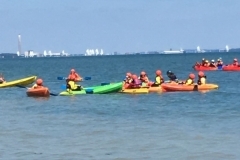 We then decided to chop the lemon into smaller pieces to see if they would still float- they bobbed happily on the surface! We then carefully took the rind of the lemons off and popped them back into the water…and they sunk. We discussed how when we took off the rind, we were removing the lemon’s life jacket because the rind is full of thousands of tiny air bubbles. When you take them away the flesh that’s left behind is heavier than water. Why not try investigating this at home with limes? Let us know what you discover. Can we make a paper clip float? That was today’s challenge in Science Club. We first tried this by putting a paper clip in a bowl filled with water and, as we expected, it sunk. We then got a piece of tissue paper and gently dropped that onto the surface of the water. Very carefully, we put the paper clip onto the tissue. Using a pencil with a rubber on the end, we carefully poked the tissue ( not the paper clip) until the tissue sunk, but the paper clip floated! This works because of something that us scientists call surface tension. It means that there is a sort of skin on the surface of the water where the water molecules hold on tight together. If the conditions are right, they can hold tight enough to support the paper clip. ​Does the size of the paper clip affect its floating ability? Can the surface tension be made stronger by adding something to the water? Today we explored the effects of carbon dioxide. 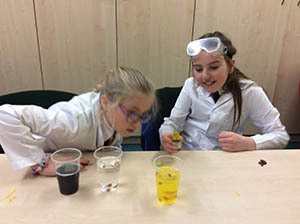 We did this by adding sultanas to both a glass of tap water and a glass of fizzy water (with a few drops of food colouring in the fizzy water so that we could distinguish between the two glasses). When they were put into the tap water, the sultanas sank to the bottom. 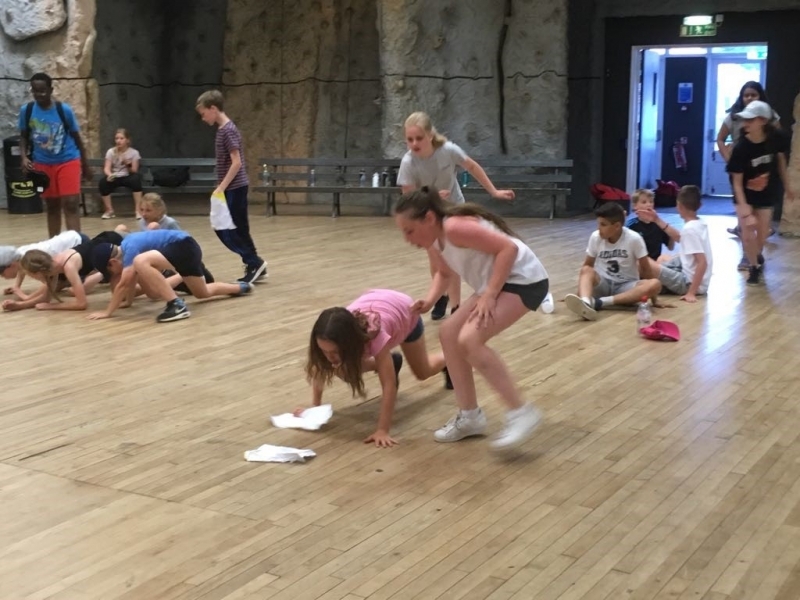 However, when they were added to the fizzy water, they floated to the surface and then sank to the bottom- just like they were dancing! 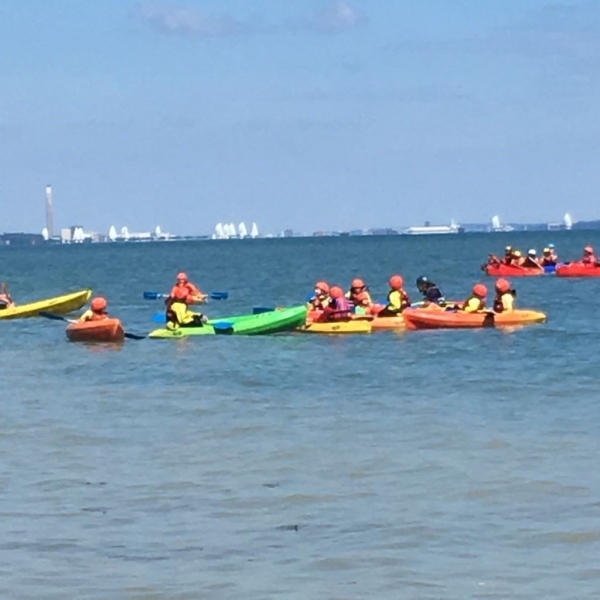 We discussed why this was happening and how fizzy water contains a large amount of dissolved carbon dioxide. The carbon dioxide bubbles are less dense than the fizzy water, so they rise to the surface. The sultanas initially sink to the bottom as they are heavier than water, but as the bubbles start to rise to the surface, they attach themselves to the sultanas, causing them to rise too. Once the sultanas reach the surface, the bubbles supporting them pop, causing them to sink again. But they rise again as new bubbles lift them up. Have a go at home and let us know what you find out. 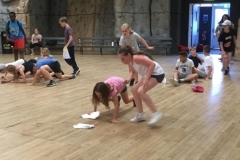 You could also try different types of fizzy drinks or maybe experiment with other objects to see if you can make them dance as well! Read on for our method of how to make water walk! ​First, fill two glasses of water and add some food colouring. Then, place the two glasses containing food colouring and water either side of an empty glass. Wait and you will see the water ‘walking’ along the kitchen roll and falling into the middle glass. Did you know that some Scientists now believe that liquid water may still flow on Mars? 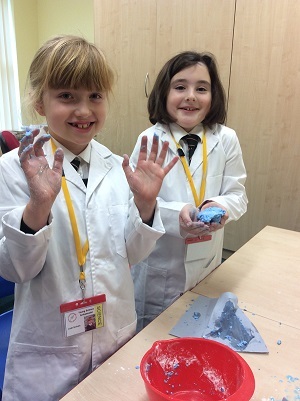 We got very messy today making our own oozy slime. We did this by using cornflour, water and food colouring. 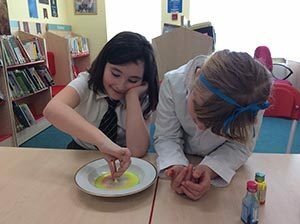 We added water to the cornflour and food colouring slowly until we had a very thick creamy mixture which felt like a stiff liquid when we were mixing it with our hands. We were amazed at how it felt a bit like rubber when we had finished mixing it, but when we squeezed it between our hands it changed so it felt soft, similar to plasticine. Almost immediately after we stopped rolling and squeezing it it flowed out of our hands like a runny, messy, oozy slime! 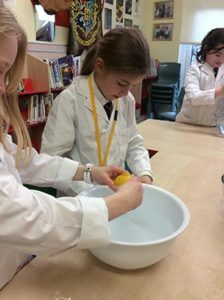 We investigated the science behind our slime and found out that when you mix cornflour and water together it forms what’s called a suspension or colloid: Tiny, solid particles (of cornflour) suspended in a liquid (water). In Year 1, Zach & Dominic were looking into the best material that they should use to make an umbrella for Ted the teddy. In Year 3, Lyra & Anselm shared their investigation on the effects of plaque on their teeth. In Year 4, Vincent & Olivia learnt about the uses of carbon dioxide and discussed their investigation where they found the weight of carbon dioxide in fizzy drinks. 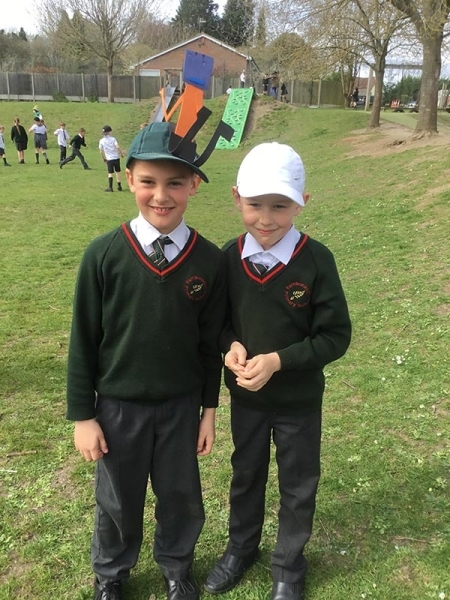 In Year 5, Joel & Sophie shared mnemonics that they had made up to help remember the order of the planets. 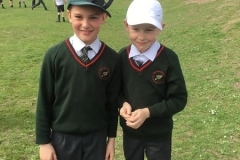 In Year 6, Felicity & Joshua had been finding out about how different activities can affect your heartbeat. Old Penny To New Penny! Today we had fun carrying out an experiment where we transformed old dull-looking pennies into pennies that became bright and shiny! We did this by putting the penny into a bowl of tomato ketchup (making sure it was completely covered) and leaving it for three minutes. We then had fun getting messy fingers by rubbing the sauce into the coins for another thirty seconds. The next step was to use water to rinse and clean all of the ketchup from the penny. Finally, we dried the penny with a tissue. The results were amazing! Instead of dull-looking coins, we had money that was so shiny we could almost see our reflection in them! We learnt that the salt plus the acid in the tomato sauce formed hydrochloric acid and this reacted with the copper.